Mermaids Millions is a video slot machine that will take players deep into the seas and the oceans where they can search for the treasures and the fortunes that lie underneath. Players will get to travel underwater where they can explore a whole new world with mermaids, sea horses and the god of the waters, Poseidon. 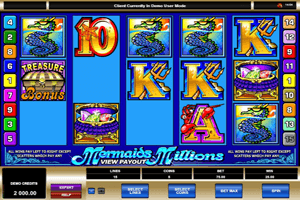 Play Mermaids Millions Slot here. Players will only have to place their bets and click on spin so the reels will start spinning so they can start forming winning combos and earning the payouts and the rewards that the game has in store for them. The bets are placed at the bottom where players will choose how many of the 15 lines they want place stakes on, as well as the number of coins they wish to place. The symbols are all inspired by the underwater theme of the game, this is why players will see sea horses, fish, Poseidon, his pitchfork, sea shells, pearls, mermaids, a treasure box and card symbols that come surrounded by sea creatures. Poseidon is the wild icon of the game which will increase players’ chances of winning as it can replace any of the other icons that appear on the reels. There are two more special symbols, the mermaids, which is the scatter icon that can trigger 10 free spins and there is the treasure box which can trigger the Treasure Bonus round when 3 treasure boxes land anywhere on the reels of the slot machine.